Doctor Vanessa Kerry, daughter of Secretary of State John Kerry, was in San Diego Thursday to speak about health care issues. 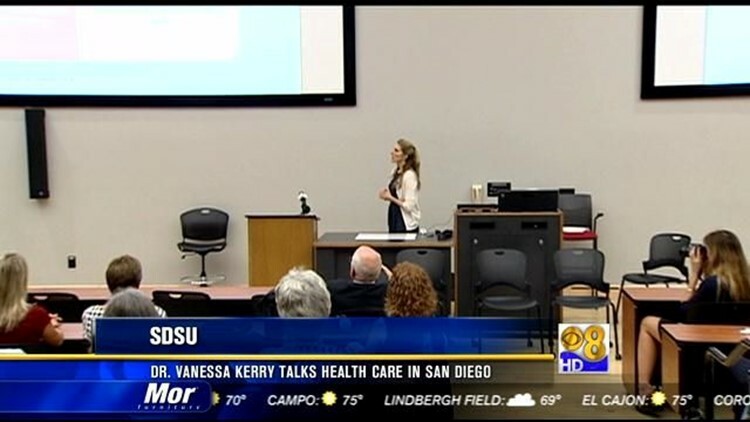 SAN DIEGO (CBS 8) - Doctor Vanessa Kerry, daughter of Secretary of State John Kerry, was in San Diego Thursday to speak about health care issues. Kerry spoke at San Diego State University. She's the CEO and founder of Seed Global Health, a nonprofit organization that sends doctors and nurses to developing countries. She says the program is a win-win for everyone. "We know that people who serve abroad or spend time working in medicine and health abroad are more likely to come back to this country and serve in underserved areas. So we see this as much as investment in the countries where we're working as it is in the United States," she said. This past summer, seed global health sent dozens of health professionals to provide assistance in several countries in Africa.